RECOLLECTIONS OF ST JOHN’S WOOD. 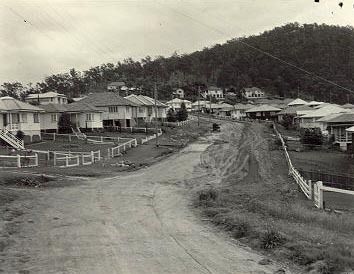 I just happened to be at the Ashgrove library yesterday afternoon and, exiting, my attention was drawn to the photo … of that dirt road named Buckingham. So I thought I would set out my recollections of growing up in the Woods. My parent’s names were Herbert George Walker, always known as Tim, and Margaret May Walker (nee O’Loughlin), always called Peggy. My parents divorced in 1973 but Mum stayed there until she died in December 2005. I have an elder brother named Mark. I think the house was built in 1940s, as the Title was issued to a Ronald James Marshall on 8.2.40. The original Deed of Grant was to John Frederick McDougall. It was a typical wooden house of its era, an icebox in winter and an oven in summer. There was an old fibro shed in the back yard which became sleeping quarters for my brother and me later. You will obviously know of the connection to the Granite House. I still have a very rusted horse shoe found in the back yard. Our house was one backyard from where the Hall is. Speaking of backyards, there was the backyard dunnies present in every yard; not a pleasant smell, and the disposal of rubbish was by burning it in your backyard. How things have changed. I can recall these people as being neighbours of ours in Buckingham Street. Starting down at the corner of Laird Street, there was that lovely brick cottage owned by Mr & Mrs Stroud. I can always recall passing the cottage and saying hello to Mr & Mrs Stroud. Next to them was a house always occupied by Army families. I believe a Major lived there during the sixties when Vietnam was active. Next, was a couple with one daughter, names lost. Very upright people but in later years a bloke I always stopped to chat to when mum was getting older. Next house was occupied by multiple families. One could have been the Martins? Next to our house was old Mrs MacArthur. She copped a lot from my brother and me. Balls and kids over the fence, noise and pinching her beautiful mandarins. The taste of those mandarins is still remembered. On the other side were the Deans, then an air force sergeant, then the Swans, another big family, then the Johnsons, the Burges, the Hollywoods, then the builder Frigo. On the other side was a large house later owned by someone I met named Michael Craig , the present owner of the Jubilee I believe; beside that house to the right was the Byrnes. On the other side was a fibro shack. I recall police attending for a stabbing in the very early sixties, the police wearing green uniforms, and the car having a telephone piece mounted on the top of the dash. Beside that shack was the Andersons, then a family with 2 young daughters who grew up to be quite good lookers, then the Harveys, then unknown , then a family whose father owned a service station on Latrobe Terrace Paddington which is now the drive in coffee shop. Further up was Debbie, whose surname I should remember as she married a mate of mine. Behind us in Piddington Street were the Marnanes, another family who I never got to know and a lovely solid brick house lived in by an elderly couple named Mr & Mrs Davis. I recall being told by Mr ?? of the Granite House having servants, of the creek prior to the dam being built as a deep and flowing creek and a drawbridge being the crossing point. Next to their house was the servant’s quarters for the Granite House which was owned by that famous Qld breakaway, Jules Guerassimoff . Across the road from the Stroud’s house on the corner was a massive block of land which the owner subdivided eventually. The parks along the creek boundaries were well used by kids. I recall playing day long ad hoc cricket games with Don Davies (from Royal Parade) and the Halpin brothers from Gresham Street. The swings near the picture theatre were used to get to the horizontal and produce a “g” force effect and would fill hours of fun. I recall there was a stone plinth memorial to a man who was killed in 1942 flying Lancasters which was near the swings. His family erected it and lived on Royal parade. Is it still there? A bit further down that part of Royal Parade (near Grand Parade) was a family who kept pet kangaroos. hen there was the foot crossing across the creek at the bottom of Grand Parade to get to Greenlanes ; another place of endless fun for kids. On the other side of the creek to Greenlanes was a bush track that took you to the Bennetts Road crossing. Walking along that track would take you past an old disused firing range that was in a small quarry. It has been filled in now and is the landing area from the 8th tee of Ashgrove golf course, and the foot track has been consumed by the club as well. Speaking of quarries, who can recall the sirens, the waiting, then the explosions, occasionally sending rock missiles through the roofs of neighbouring homes? You could get a good view of the rock explosions from Mater Dei school yard. There were other creek crossings in handy as well. Down on St Johns Ave was a home that also was a small business selling groceries. Near them was the original crossing; you needed to scramble down a steep creek bank to get to the other side. Then the crossing moved a bit up stream then to where the bridge is now. I recall that bridge was bent out of shape after its first flood experience. Childhood in the Woods… I got involved in every sport available, even getting involved with Oakleigh Aust Rules club which played on the oval of what is now called Ashgrove sportsground. The area next to it, where Valleys and GPS play, and before that a Marist Bros sportsground, was a dump (next to Acacia and York). Further child adventures involved fireworks. Fruit juice came in long cylindrical tins. Combined with a thre’penny bunger, those cans used to fly high. My brother and I were given a chemistry set, and a hypodermic needle; as you were in those days. We combined a few of the chemicals and gave Mr ? ?’s banana tree an injection from which it did not survive. - then Mr Lancaster’s butcher shop. Mater Dei church was well patronised and multiple masses were heard every Sunday. Both my brother and I did duty as weekday altar boys. And that theatre… canvas seats and I believe it was still in use up to the 1970’s. The floods would cut the suburb off but only for a day. In my teens, the floods were an excuse to ride tyre inner tubes down the flooded creek launching from the Bennetts road crossing. he 176 (?) bus would terminate outside the Stroud’s house. And in those days, smoking was permitted on the buses!! I loved the suburb. I live in Kelvin Grove and always look towards the hills at back of the Woods. When Vietnam was active, the sounds of the rifle ranges at Enoggera were audible and heard often. After Aust had left Vietnam, I recall a night time exercise that must have got a bit out of hand as the gunfire, flares and ambushes went on all night and the exercise fighting drifted down towards the houses at the top of the suburb. To finish, an overall impression of the suburb was …. children; just about every house had them. I stand to be corrected if I have anything wrong. This is all just from memory.